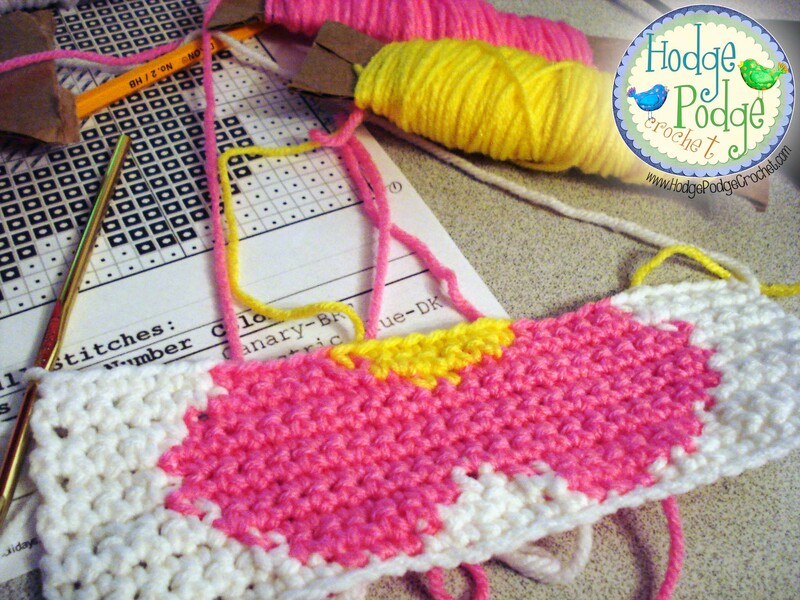 Crochet graphghans are AMAZING to look at but they can be very intimidating to jump into–especially if you really aren’t confident with color changing OR if you haven’t ever attempted cross-stitching. But it really isn’t very hard once you get the hang of it and the only supplies you will need are ones you probably already have on hand; some yarn, a hook, and a few basic skills! 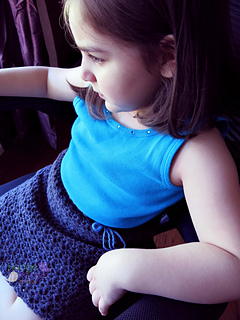 To get started, I recommend that you pull up your favorite search engine and type in: ‘free simple cross stitch patterns for children’. You should have at least a hundred free sites to choose from and endless possibilities! One of my favorites is DLTK’S Crafts for Kids. They offer what you need as a beginner—simple patterns that are perfect for practicing this project. 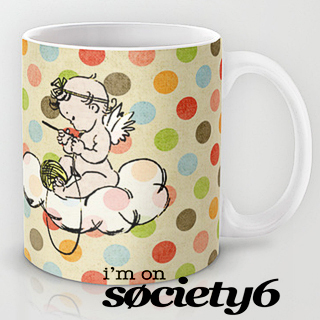 Once you find one that you like, you can choose to print it out in black and white or in color. Here I’ve chosen to print Blue Flower but you can choose anything you feel comfortable working with. 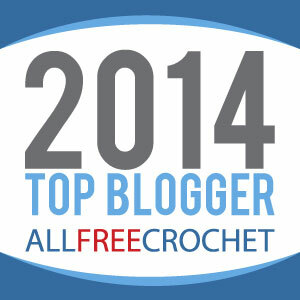 Keep in mind that the simpler the design and the less color changes you have, the easier it will be to crochet. Now comes the fun part! For this project you can use any size hook you are most comfortable with. For me, that’s an H/5mm. After you’ve selected your hook, it’s time to get your colors together! 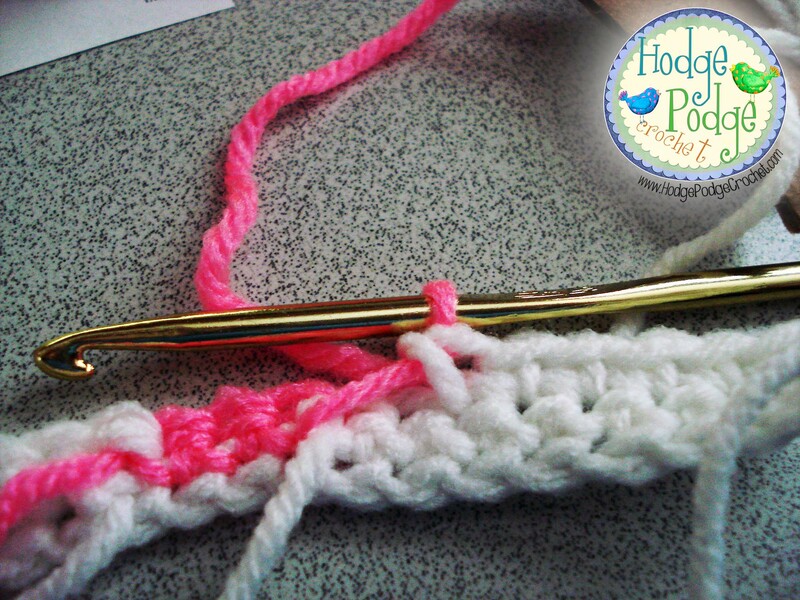 Use an acrylic yarn that’s worsted weight because it’s the simplest to work with. If you want to change your colors from the ones that are recommended, make sure to note which new color corresponds to the correct symbol so you don’t accidentally get them mixed up while crocheting! Next, it’s time to look at your graph and figure out how many bobbins you will need to load. Bobbins are super simple to make from scrap stuff you have around the house–so don’t panic if you don’t have any! In order to make one, all you need is a small amount of scrap cardboard or flat plastic. You could even get away with making them out of cardstock but you want to make sure whatever you use is sturdy enough to take having yarn wound around it without buckling on you. If you’ve ever done cross-stitch work, then you should be familiar with what a bobbin looks like. Instructables.com has a great mini tutorial to show you how to make your own in a few simple steps! Once you have yours finished, it’s time to load them up with yarn and get started. 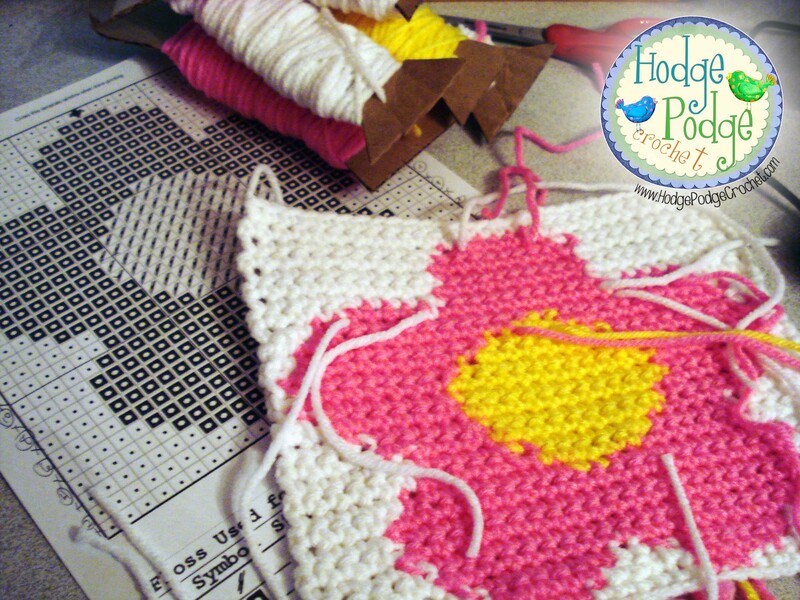 For my project I’ve loaded two large white and one smaller white for the border, two large pink for the flower, and one large yellow for the center of the flower. You will probably have different colors than me and if you are working another graph you may have more or less bobbins than me. After your bobbins are loaded (don’t worry about how much yarn you’ve loaded onto each because you can always add in more yarn later if you need it,) it’s time to plan your strategy! The way you attack any graph is to look at the boxes. Each box represents ONE single crochet. 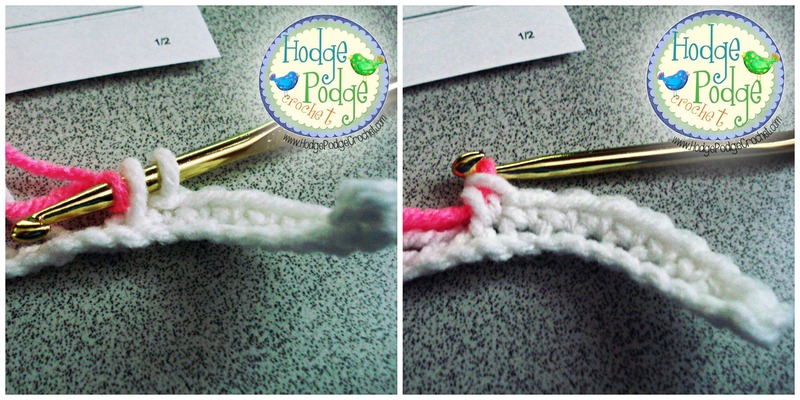 You can also crochet your graph from any side as long as you are consistent. Quick tip here: use a pencil to keep track of your rows as you go!! It makes things much simpler and is invaluable if you have to get up in the middle of your project. I number the row I start with at the beginning and place an X at the end of it to show that I’ve completed it. For row 2 I see that I need to single crochet 9 in white, 3 in pink, 6 in white, 3 in pink, and 9 in white. This is where my preloaded bobbins will come in handy! Begin with a sc in the 2nd chain from the hook. Single crochet in the next 8 chains. 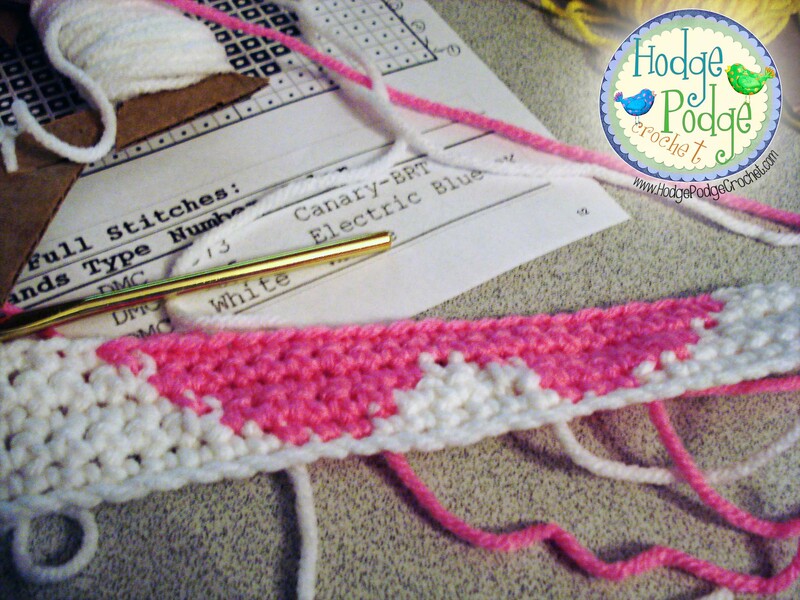 When you get to your LAST white (or whatever color you have chosen to use here) single crochet–do not finish it. 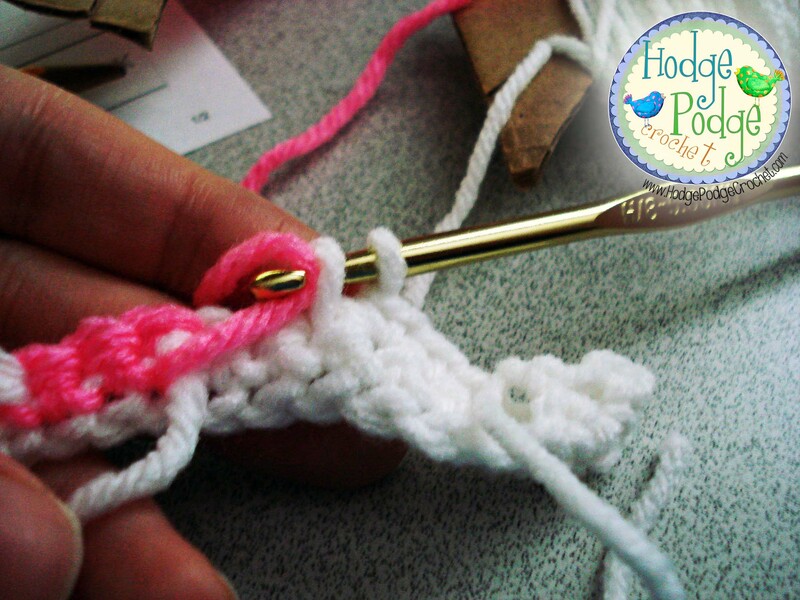 Work that single crochet as follows: Put your hook through the chain and pull up a loop. Attach the next color to your hook and pull through all loops on hook. Color change complete. To continue your graph you would simply chain one and begin your next row. Looking at the next row on my graph, I see that I need to crochet 7 in white, so I will crochet the first 7 making sure that I don’t complete the last single crochet. You will notice in this row that when this color ends and the next one begins there is a little bit of a stretch. DON’T PANIC!! Once you get those two loops on your hook it’s time to do a little cheating!! Most people who work graphghan blankets will do a LOT of cutting and rejoining–and that always ends in lots of tails (and tears after weaving them all in!!) But I’m lazy by nature and I say there isn’t any need to do so much work as long as you are careful and follow my lead here. Whenever you need to join your next color in a chart, a good rule of thumb is to take into account the amount of space between the change. If it’s more than 5 or 6 spaces, add in a new bobbin. OR, if you need to add in a lot of another color, add in a new bobbin. However, if you find yourself in a situation like this—where you have a bobbin attached already and there is a gap of say 3 or 4 stitches, simply trail your yarn in backward. How do you do that??? I’ll show you! After you get your last single crochet set up, simply bring in your new color the same way you did when you set up your last row! Keeping things relatively LOOSE (so you avoid nasty puckers) join your new color by bringing it across the front of your work. Pull through to join. It’s that simple. 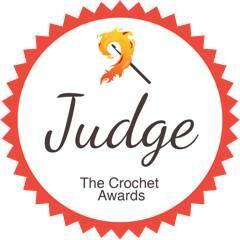 Now the trick to hiding your ‘trail tail’ is to crochet over it and no one will ever be the wiser that it’s there! 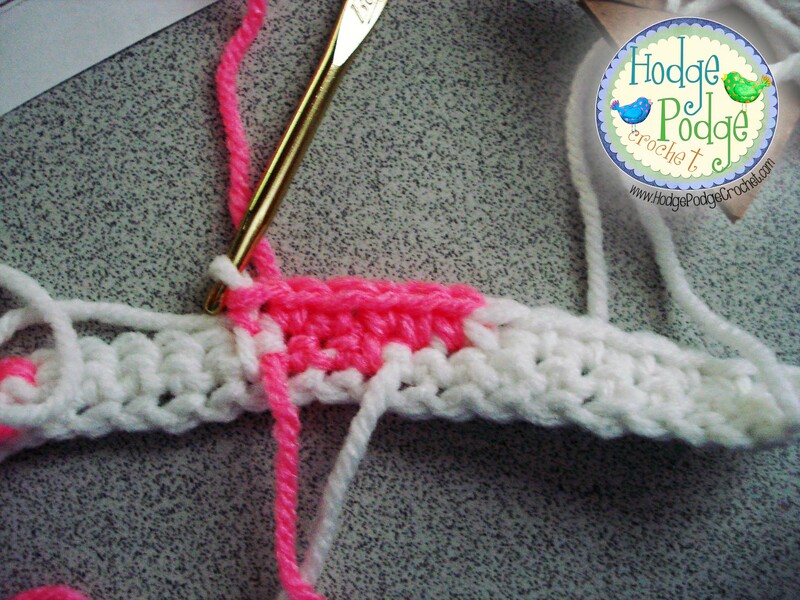 In order to crochet over your tail, make sure you are putting your hook under the tail AND both loops for the entire length of the tail. Doing it that way will ensure a cute (and neat) finished project. Also, keep an eye on that tension. New crocheters tend to pull either too tightly, forcing all of the stitches to move out of alignment at the joins, or too loosely—and that creates horrible gaps at the join!! You don’t want either so you may have to practice a few times to get it down. Don’t give up though!! After you finish a few more rows, you might notice that some of your bobbins are no longer needed. In order to make your life simpler, snip those off, leaving a long tail to weave in later, and set them aside. 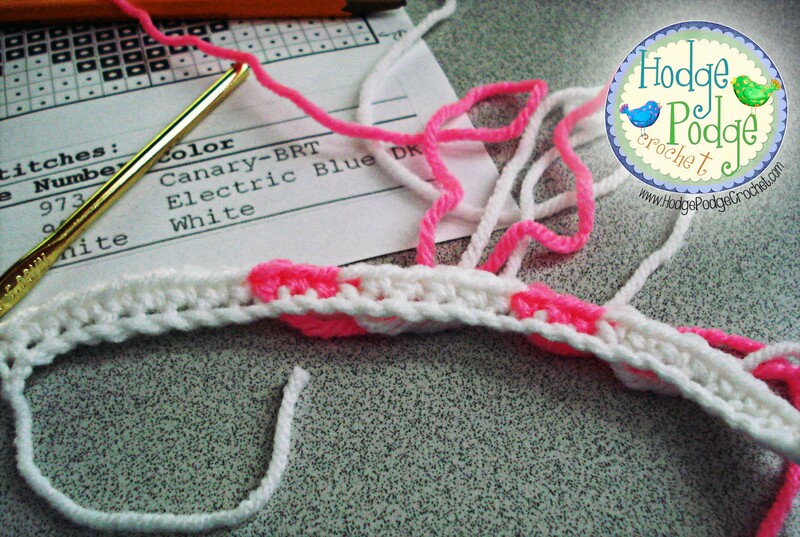 Continue on this way, adding in new color and crocheting over your tails when you have to, all the way up your graph! Once your graph is complete, the only thing left is to weave in your tails! Since you should have been leaving relatively long tails when cutting your bobbins loose, you can use the extra length to close any oddball gaps in your joins that you may have. That’s all there is to creating a beautiful tapestry crochet piece and it works the same with ANY graph at all. 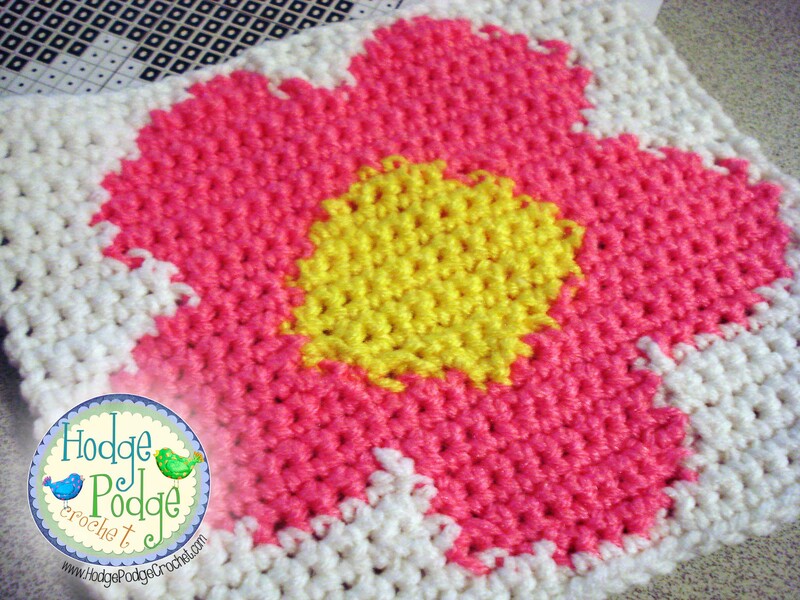 After you have some simple projects under your belt, scale it up and create a beautiful graphghan! 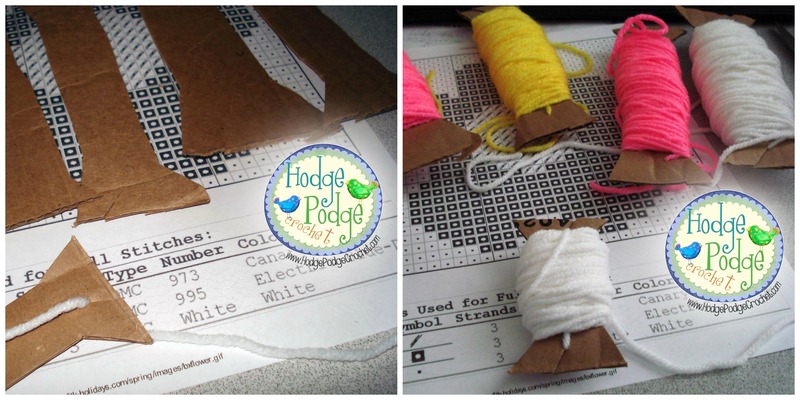 Larger projects will take longer, but they all follow the same steps outlined above! If you’d like to share your finished project, come find me on facebook!